Brad helps them rediscover their passion. Drown them with statistics and facts about how to change behavior. Brad doesn’t do that. 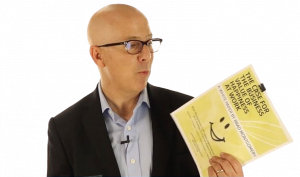 Gives employees a straight-forward, accessible method (embedded inside a humorous, upbeat, interactive program) to access their passion, commitment and connectedness toward their work. – What they do is important. – They make a difference to the organization. • Fewer Obstacles to Self-Motivation. • Specific concepts they’ll implement immediately. • Increased Productivity, creativity, innovation, loyalty. • Improved teamwork, and (internal & external) customer satisfaction. • Science Based. Not rah rah motivational speaker. Brad’s teaching research-backed techniques to improve engagement, which leads to improvement in every business metric. Your people are not short of information. But they crave a way to make sense of what they already know. This program helps them to feel the excitement & enthusiasm they had when they first got their jobs. They need to feel that they are less overwhelmed. They know what to do. Brad appeals to their heart and help find their own motivation to do what they know needs to be done. Brad’s pedagogical approach gives them a framework & language about certain methods to change behavior within themselves and within the organization. He creates a language around valuable concepts they’ll remember and use. Their behaviors are going to change IMMEDIATELY, as opposed to giving them data and statistics they’ll need to study and understand before they implement. 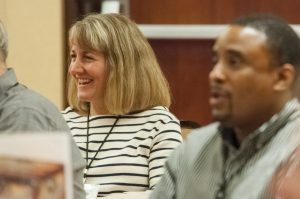 Here’s how you’ll know it worked: You’ll hear at the first coffee break, all throughout the conference and beyond, people saying, “Confetti!” You’ll hear them say, “You’re awesome!” These phrases are shortcuts to concepts I teach. And we all know that once you label and articulate the things you want to change, lasting behavior change is possible — even easy. Brad Montgomery is a funny motivational keynote speaker. He speaks to audiences in all industries and at all levels (C-Suite to Front Line) about getting more out of themselves and those people around them. Want to boost up your productivity and internal motivation? Give this motivational speaker a call. What’s Next? Call to Book Brad!